Time really flies! 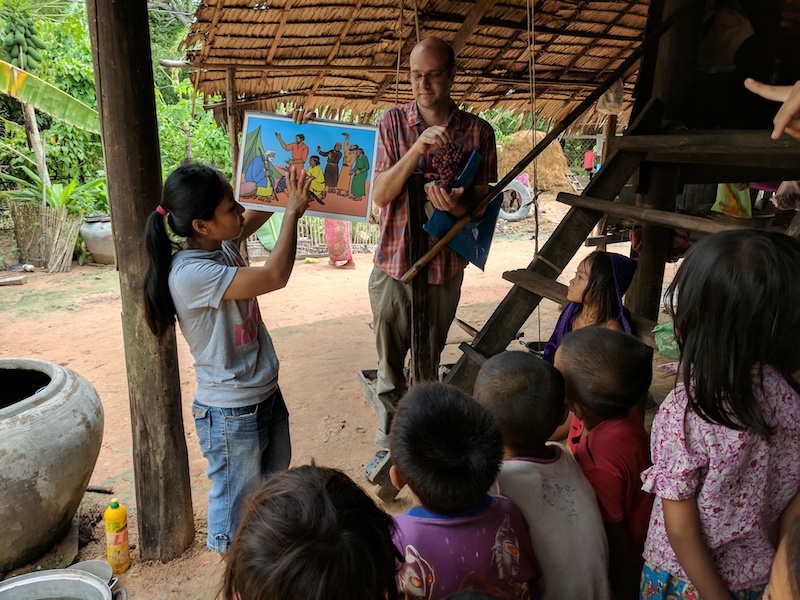 It’s hard to believe that I’m over halfway through my time in Cambodia. Earlier in September, Cambodia celebrated Pchum Ben, a Buddhist festival honouring dead ancestors. It is the most important Cambodian holiday along with Khmer New Year. One of the Khmer OMF staff gave a talk explaining the holiday. Experiencing Pchum Ben and learning about the festival was very culturally insightful but also a big reminder about the spiritual state of the country. Many Cambodians live in fear of evil spirits, not knowing the freedom found in Christ. Many strive to do good works to earn merit, unaware of the absolute holiness of God and that Christ is the only propitiation for our sins. 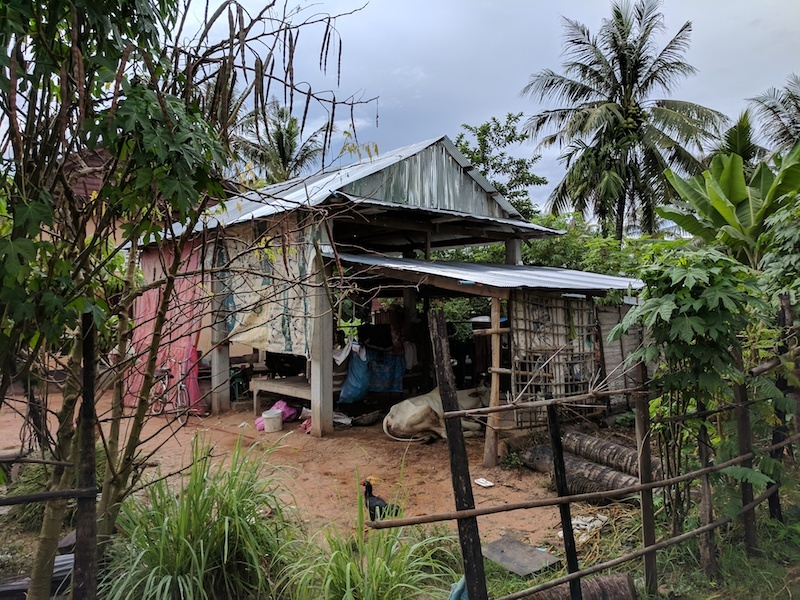 A typical house in a village near Siem Reap that OMF visits. I took advantage of my days off during Pchum Ben to take a trip up to Siem Reap. Visiting an OMF evangelism effort at a nearby village was definitely the highlight of the trip. I was very encouraged by the work being done there and the seeds that are being planted. OMF has been ministering at the village for a few years but there are still no confessing Christians. However, the village is very interested in having OMF visit every week to preach the gospel and teach Bible stories. Praise God that Christ is being preached in this previously unreached village! 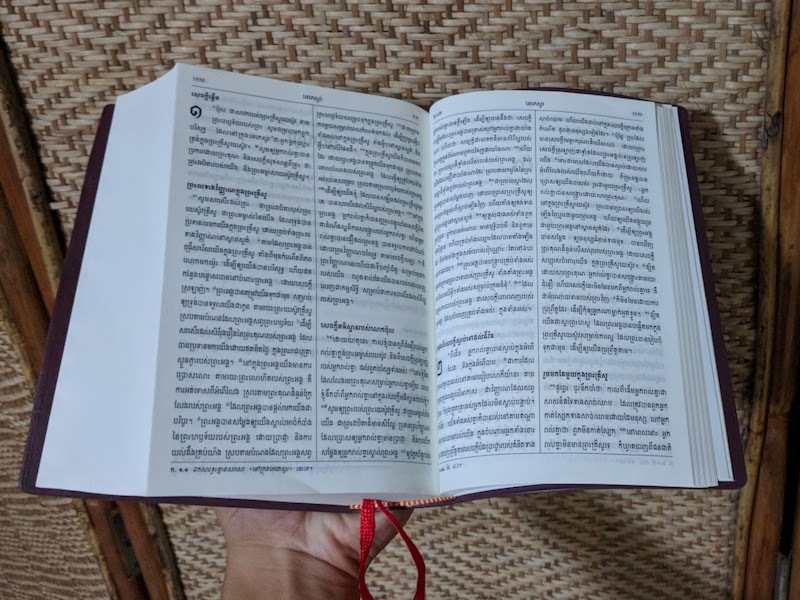 Although claiming to be Buddhist, they’ll even memorize verses of Scripture! I’m praying that God would bring growth to the village in His time. While in Siem Reap I also toured the Angkor temples. Although beautiful structures, these temples were dedicated to idolatry and provoking God to anger (Jeremiah 8:19). 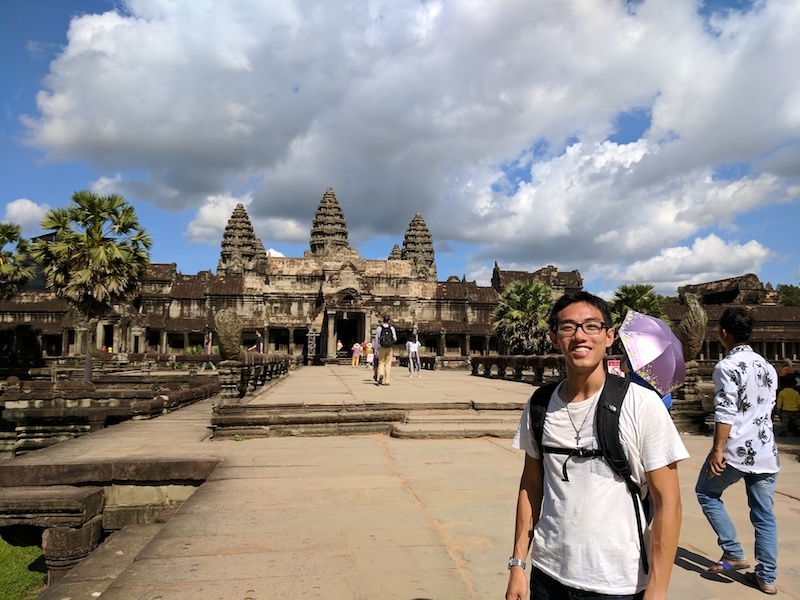 I had to remind myself that Angkor Wat is not only the world’s largest religious monument, but also the largest monument celebrating abominations to the LORD (Deuteronomy 27:15). However, I was able to learn more about the history of Hinduism and Buddhism and how religion in Cambodia developed into its modern form. 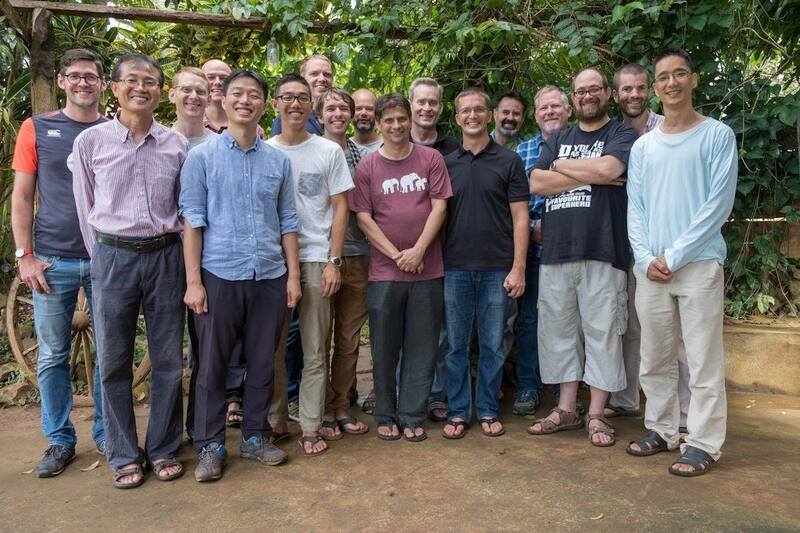 In September we also had the first ever OMF Cambodia men’s retreat, held over two nights in Mondulkiri province. We fasted for a day and had time on our own to seek the Lord through prayer and Scripture reading. Periodically we met together to share what God placed on our hearts. I was especially encouraged by the fellowship we had, praying and sharing openly united by our love for Christ. It was also a great chance for me to meet more of the OMF Cambodia team and hear about the work done in the country. OMF Men’s Retreat in Mondulkiri. Photo courtesy of Nick Radcliffe. Earlier in October, we had a few days of power outages in the west end of Phnom Penh. Generally Phnom Penh’s power grid is quite stable nowadays but I heard rumours that lightning destroyed some electrical equipment. Since my work is software-based, I had to run around for a bit trying to find power but eventually settled in a cafe with a generator. Language learning has also been progressing. I notice myself improving in basic conversation. Picking up the alphabet made it much easier for me to build up new vocabulary, which I find is always the most tedious part of language learning. My current learning routine to accumulate a list of new words while conversing in my weekly language lessons. Then throughout the week I practice and memorize those words using a flashcard app. Although I can still only read basic sentences really slowly, it’s quite satisfying to be able to read signs in the streets and menus at restaurants. I’m still a long way away from being able to read this! Please continue to keep me in your prayers. The students return to NPIC in a few weeks so please pray that I’ll have the opportunity to share the love of Christ with the staff and students there, in addition to my software development work. Please pray that I’ll continue to rely on God’s strength and His protection. Please also pray that God would continue His work in Cambodia and that more Cambodians would know our Saviour. If you want to hear more about what’s going on in Cambodia, please contact me. I’d love to share more with you!